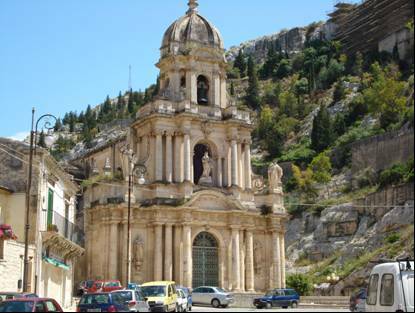 The flavour of citruses and almonds, the gold of carobs, some of the treasures you will find in Noto Valley. A triumph of decorations and artistic elements that represents a distinctive character of this landscape. 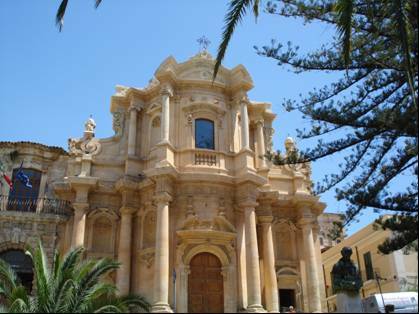 To get the Val di Noto the most convenient airport is in Catania Fontanarossa (www.aeroporto.catania.it). There are some companies that reach the city like: Alitalia (www.alitalia.it), Airone (www.flyairone.it), and Air India (www.airitaly.it). Low cost airlines are: Wind Jet (www.volawindjet.it), with flights from Rome from 20 euros (including taxes) and EasyJet (www.easyjet.com) offers daily connections from Milan from 22 , 50 euros each way (taxes included). 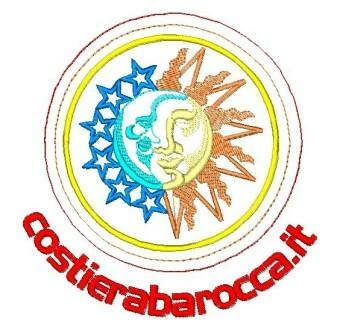 PROGRAM IN EIGHT DAYS "A journey of Light and Colors"
Sicily is an island where every look creates a "vision". Some views make the experience more exciting by the traveler. A "Journey of Light and Color" in the Noto Valley is a journey not only of places, but nature, perfumes, colors, flavors, in the journey that will set your mind the illusion of a land from the indescribable charm. Day 1: Arrival at Catania airport in late morning and meeting with the guide, departure by coach for the most important city of Magna Graecia: Syracuse. Transfer to hotel and free time for lunch. "The city built on a small island and separated from the mainland ... it's small, pretty, resting on the coast, with gardens and walks down to the beach." 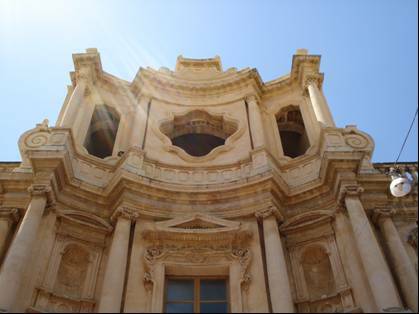 Visit the center Ortigia with temple of Apollo and the old bathroom Hebrew. Conclusion Aretusa source. In the evening dinner in a characteristic Ortigia - Siracusa Accommodation. Day 2: After breakfast departure for Acreide Palazzolo - Akrai: The town has wide streets, straight hand and little flat, lined with palaces, has spacious squares, fountains, abundant, several churches with rich baroque architecture. " In the morning we will visit the archaeological park with the greek theater, Bouleuterion, the latomie dell'intagliata and dell'intagliatella "with a large garden, deeply divided by arches, huge rocks and cliffs wrapped in white." Free lunch and in the heart of the city "The Museum of Passengers" and the Casa-Museo A. Bird: the museum admired by all visitors, preserves important evidence of material culture and intangible Iblea. In the evening dinner in typical restaurant and overnight at a hotel in Noto. Day 3: After breakfast I get inspired by: baroque pearl embroidered in soft lime honey "its urban aired more of the great Roman villas, the shrewdness, the sudden glimpses, the outlook as the eye can see, the terraces, the calls make the city a garden of stone ". Walk through the Public Garden, Port Royal; plan S. Francesco, church of S. Chiara, the church of SS. Salvatore, Piazza Duomo with the Palazzo Ducezio and, if available, visit the show of representation, the Cathedral of S. Corrado and S. Nicholas, the church of S. Carlo; church of S. Domenico and Piazza Ercole. The theater with a tour of the interior. 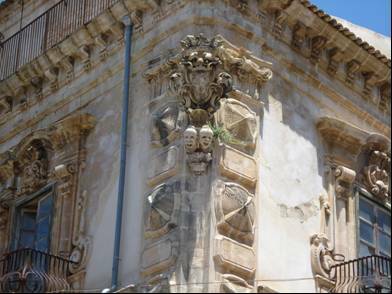 This is followed by Nicolaci with the exterior of the Palazzo Nicolaci Via Cavour and then with the exterior of the church of Montevergini, Smart Palace, Palazzo Trigona. Free lunch and early afternoon visit to the mosaics of the villa Tellaro, crossing the reserve Vendicari ideal for excursions, rich in archaeological evidence where "one of the major herbs twirl, sway, float innumerable winged dragonflies of glass." 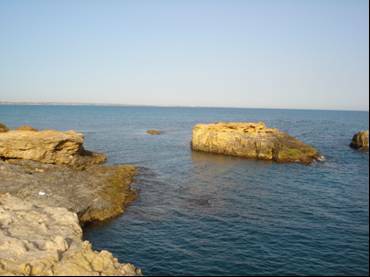 And then even further south in the far corner of Sicily to discover Marzamemi and Portopalo Cape Passero: two beautiful harbors looking to Africa "to see the sun in the bay, a steamer arrived just bring your thoughts to l ' Africa. Dinner at the local characteristic of the city and overnight at a hotel in Noto. After dinner "Noto by night" with storyteller. Day 4: After breakfast departure for the city of Ispica "eccentric city to be discovered in its most remote corners that you can expire the sobs milder or more echoing the mighty thunder." The city retains an old town that crop has its heart in the beautiful square of the Basilica of St. Maria Maggiore and dell'Annunziata. Not to be missed when visiting the city "the picturesque archaeological park of the Force" with the remains of the Palace Marchionale, old church of SS. Annunziata, the "hundred steps" and various environments dug into the rock. Free lunch and afternoon continue to shift to Sampieri, a village of fishermen that may look at Punta Secca and then with the famous house of the Commissioner Montalbano. Dinner and overnight in hotel near Donnafugata in a beautiful rural scenery ibleo. Day 5: After breakfast departure to visit the Castle of Donnafugata, with the rooms on the main floor and the park: the splendid residence in the heart of Ragusa, where "everything is golden, smooth on the cornices, Damaschino clear doors and taxes that cancel windows giving a meaning to the proud chest of foreclosure has not been any mention worthy. " Free lunch and then visit Scicli with squares, streets, buildings of every way that proclaim a considerable degree of public wealth "from Italy piazza dominated by the Church of S. Matthew; palaces Mormino Penna; Fava palace, palace Beneventano, via M. Pen with the churches of S. John, S. Michele S. Teresa and the buildings of the Municipality. In the evening arrival in Modica dinner and overnight at the hotel. Day 6: After breakfast full day excursion to Modica "city where the theater is the country, with its one hundred churches, its bell, with its Baroque style similar to the clays of Caltagirone, fragrant jasmine to the sunset in the winding stairs and squares profile adventurous ": church of St. George, S. Peter S. Mary of Bethlehem, St. Domenico, Carmine, Church of S. Nicholas, S. Maria del Soccorso with the college of the Jesuits, birthplace of Quasimodo room with poetry; Teatro Comunale. Free lunch and sweet taste of chocolate embroidery. In the evening dinner and overnight stay in Ragusa. Day 7: After breakfast visit to the town of Ragusa Ibla, which winds up in crooked streets, narrow and ruinous to the square is large, lively and excellent and abundant showy buildings with the church of S. George can be one of the buildings with a striking degree of magnitude and uncommon. " It begins by Rome, the Bishop's palace, the Abbey church, the church of S. John, of exterior building Zocco; Bestini building, Palazzo del Comune, Palazzo della Cancelleria; church of S. Maria dell'Idra; church in Purgatory; outer palace Cosentino, La Rocca building with a visit inside. Free lunch and then for the church of S. Giorgio, Piazza Duomo, Conversation Club, outside of building Donnafugata; church of S. Joseph, Church of the Magdalene only facade; Garden Ibleo arm of S. George. In the evening for dinner and overnight Cartagirone. 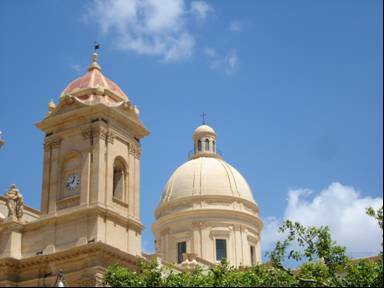 Day 8: After breakfast visit to Caltagirone: Capuchin monastery, the city center and the secrets of ceramics "Calatina". Free time for lunch and in late afternoon, transfer to the Catania APT for return. Groups of 8 to 30 people.